It’s common for employers that compete intensely for talent to have cool workplace perks like ping-pong tables and free lunches. But I think it’s more meaningful to offer employees tangible help to work toward improving their lives. After all, they can only get so good at playing ping-pong—but helping them get better at managing their personal finances can have a long-lasting impact! 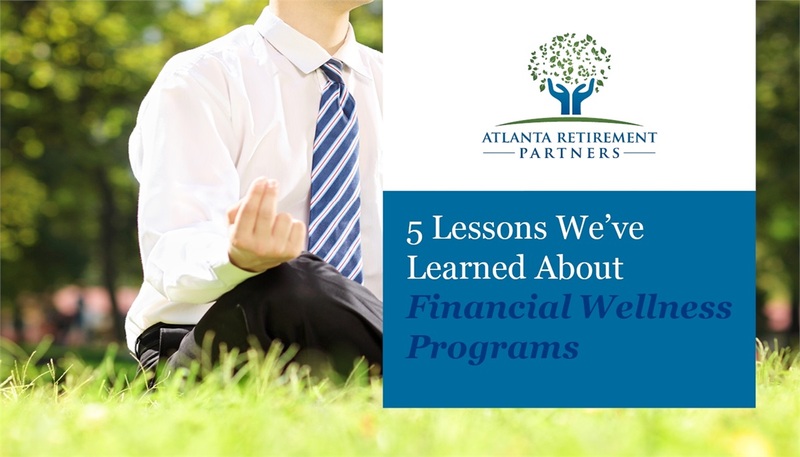 At ARP, we believe that a good financial wellness program can improve employees’ loyalty, productivity, and retirement readiness. If you think of experiencing financial stressors like facing a multi-headed monster, you can understand why your employees may often need help. 1. Understand how it can help recruiting and retention: We think this program works especially well as a retention tool for white-collar employers with a lot of well-educated employees. These people often carry student-debt burdens. For example, we work with an Atlanta architectural and engineering firm that has a lot of young employees with heavy student debt from their top-notch college educations. The employer wanted to help them understand how to curtail their budgets and shift more money to debt repayment. Of the 150 employees, 40 participated in ARP’s recent financial wellness “boot camp” program. Paying for the program made sense for that client not just because of its paternalistic philosophy as an employer, but also because it competes for talent in an industry with a very tight labor market. 2. Mix technology and in-person coaching: When it comes to employee engagement, you really have to watch out for attrition with financial wellness programs. If an employer’s program only utilizes online learning and tools, it usually has a low stick rate: a bunch of employees try it out but many quit when there’s no one urging them to keep moving ahead. People need the accountability that in-person coaching brings. We use Dave Ramsey’s SmartDollar program for the technology part of our program, and we couple that with our customized on-site meetings. Depending on the client’s preference and budget, we conduct monthly or quarterly group sessions. At the meetings, we talk about key concepts like proper budgeting and how to attack debt in a methodical way. In our experience, it is not enough to present these concepts; for greater impact, we also give employees handouts with work to do before our next meeting. This way, they actually put pen to paper and start making quick progress. 3. Offer incentives to take action: It’s critical to give people an incentive to engage with the program. We helped our architectural firm client set up access for its employees to SoFi, a student loan refinancing provider. The employer also makes a match: when an employee using SoFi makes a monthly payment toward reducing his or her debt, the employer matches that at 50%, up to a maximum monthly dollar limit. This has turned out to be very, very appreciated by participants—even more than the 401(k) match, I think. For employees who have been feeling stressed out about their student debt, it really hits home as a caring gesture. 4. Give it time to really work: We call our program a “boot camp” to convey a sense of accountability. We’ve done the boot camp as a six-month and as a one-year program, because it takes time for participants to really work through the key takeaways. This program works best for an employer with a lower turnover, because its effectiveness depends a lot on employees staying long enough for the program to really make a difference for them. If an employer has a 50% annual turnover, the workforce isn’t steady enough for the program to have a meaningful impact over a year or more. 5. Look at quantitative and qualitative results: An employer thinking about doing a financial wellness program naturally wants to know what ROI (return on investment) can be expected. The financial services industry hasn’t yet developed a rock-solid methodology for calculating the ROI of these programs, although it’s getting closer. At ARP, we gauge success partly in a quantitative way, by measuring the outstanding student debt a program participant had at the beginning of the boot camp, then the balance at the end. We also look at the qualitative results of surveying participants about how they gauge the program’s impact on their professional and personal lives. If we can show an employer thinking about doing a financial wellness program the employee-impact data from a similar client’s program, that’s where the rubber meets the road. The example provided is based on a real-life situation. The opinions voiced in this material are for general information only and are not intended to provide specific advice or recommendations for any individual. To determine which approach, investments or strategies may be appropriate for you, consult your financial advisor prior to investing.